REDDING, Calif. - The Simpson University Athletics Department honored senior Jodie Richards with the NAIA (National Association of Intercollegiate Athletics) Champions of Character Award for her leadership on campus. Richards, a communication major from El Dorado Hills, Calif., plays for the Red Hawks softball team. She has served as team captain, leading devotions and meeting with players to talk about their Christian faith. 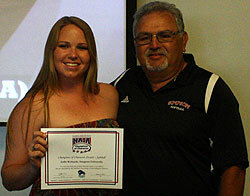 The past two years, she was named an NAIA Scholar Athlete. She also served as a First Year Experience leader on campus, working with new students. The NAIA Champions of Character program seeks to change the culture of sport by helping participants build character in five core areas: integrity, respect, responsibility, sportsmanship, and servant leadership. Learn more about Simpson athletics at simpsonu.edu/athletics.